S alt. It helps make food taste good, and your body needs sodium to function properly. But we also know that the consumption of too much sodium is bad for your health: It has long been associated with high blood pressure, heart disease, stroke, kidney disease, and water retention. So how much salt should you eat? Depends on whom you ask, and who's asking. With all the conflicting messages out there, it's no surprise that there might be some confusion about how much salt is safe to eat. The fact remains that most Americans consume about 3,400 mg (about 1 1/2 teaspoons) of sodium a day, an amount that is considered dangerously high by government, AHA, and IOM standards. In fact, in its findings press release, the IOM clearly states, "Recent studies that examine links between sodium consumption and health outcomes support recommendations to lower sodium intake from the very high levels some Americans consume now," though the studies did not conclude that going below 2,300 mg was beneficial. Our takeaway: While how much to reduce our salt intake is an individual question best worked out with one's doctor, it's safe to say that the vast majority of us would do well to eliminate the extra sodium we're eating. It's worth repeating: Excess salt consumption is linked to high blood pressure and other serious health risks, and easing back on salt has other benefits, as well. "Excess sodium intake causes your body to retain water, putting an extra burden on your heart, kidneys, and blood vessels," says Deborah A. Renza, managing editor and contributor to the American Heart Association Eat Less Salt: An Easy Action Plan for Finding and Reducing the Sodium Hidden in Your Diet. On a less life-threatening note, water retention also affects your physical appearance. Renza explains, "[It] may make your face feel puffy, give you bags under your eyes, increase swelling in your fingers, and make your jeans look and feel tighter." By lowering your sodium intake, you'll be cutting down on calories, fat, and processed food, while getting reacquainted with your food's natural flavors. So are you ready for better health and looser jeans? 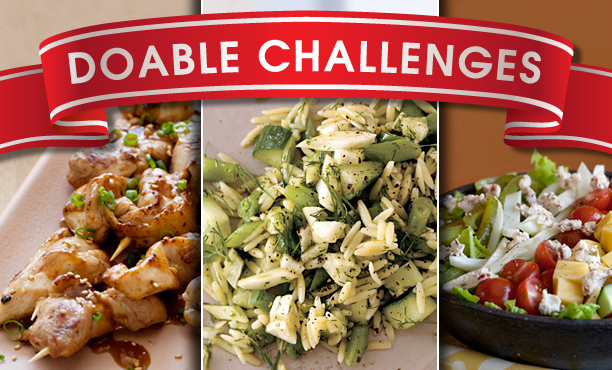 Then dive into this month's Doable Challenge! Most of your sodium doesn't come from the salt you use to cook with or add for flavor. According to Eat Less Salt, 77 percent of our sodium intake comes from processed foods. We know, we know: You don't eat processed foods. But remember, "processed" doesn't just mean the obvious things like canned soups and snack chips: It also includes most store-bought bread (even homemade bread can be surprisingly salty), pizza (thanks to the salty cheese, sauce, crust, and toppings), canned vegetables, store-bought broths and stocks, cheese, poultry that's been "plumped" or "enhanced" (treated with a salt-water solution, increasing its weight and sodium content), deli meats, soy sauce (including the "low-sodium" variety), and vegetable juices. You may expect breaded, brined, or pickled foods to be high in sodium, but sodium can lurk even in cookies, muffins, and breakfast cereals. According to Renza, "the combination of fat, sugar, and sodium creates the taste perception that a cookie is deliciously sweet, when in fact it can be as high in sodium as a salted pretzel." On certain products, such as low-fat cheese, the label "reduced fat" also means "higher sodium," since manufacturers often boost the sodium content to enhance flavor. Jessica Goldman Foung, creator of Sodium Girl and author of Sodium Girl's Limitless Low-Sodium Cookbook: How to Lose the Salt and Eat the Foods You Love, also suggests carefully reading labels on all foods, especially seasoned bread crumbs; vinegars; store-bought condiments like mayonnaise, ketchup, barbecue sauce, hot sauce, and salsa; many dairy products, crackers, canned beans; and seafood (some of which, especially shrimp, is treated with a very-high-sodium preservative). And when reading labels, note that "less sodium" or "reduced sodium" just means less than the original—so super-salty products like soy sauce still contain a fair amount of sodium even in their lower-sodium form. First, says Renza, review your pantry, fridge, and freezer to find out which of your go-to products are highest in sodium. Next, replace the highest-sodium items with lower-sodium or sodium-free alternatives. And finally, reduce how much and how often you use the higher-sodium products you do keep around. It can be as simple as skipping foods you eat by habit but don't necessarily crave; replacing one brand with a low-sodium version; or eating smaller portions of salty things you love. For example, when you're making your favorite pasta recipe, don't salt your water, make your own pasta sauce using either fresh tomatoes or canned tomatoes without added sodium, and then top the dish with fresh herbs instead of a mountain of salty Parmesan cheese. Replacing high-sodium foods in your pantry or fridge with lower-sodium alternatives is easier than you may think. Most convenience foods—including canned beans, stocks, spice blends, and many condiments—now come in low-sodium versions. And training yourself to read labels can help you make simple changes that lead to a healthier you. For example, corn tortillas tend to have much less sodium than those made with flour, making them preferable for tacos, wraps, and sandwiches. In developing recipes for Sodium Girl, Foung uses less-salty alternatives of her favorite cheeses, including low-sodium versions of paneer and ricotta. She uses them in dips, veggie burgers, and in place of salty feta and goat cheese in salads, such as her Greek Salad with Pickled Beet "Olives." And since jarred mayonnaise is generally high in sodium, she uses Greek-style yogurt in its place (she favors the Fage brand because of its low-sodium content). "It's not only healthier, but tastier," she says. Good news for frequent users of this site: One of the best ways to control your sodium intake is simply to cook your own food. Preparing your own meals and snacks puts you in control of how much sodium you consume, especially once you've taken steps to "rethink, replace, reduce." You can drastically reduce the sodium in your favorite roast beef or turkey sandwich just by making it yourself, with lower-sodium cold cuts, a low-sodium bread such as homemade Whole Grain and Honey Bread, and a careful hand with the condiments. You might also go the extra step and "roast a turkey breast or lean beef on the weekend and use it for sandwiches throughout the week," suggests Renza. Take charge of your meal's sodium content by making simple choices and swaps: When making pizza, use cheese sparingly and top it off with vegetables instead of cured meats. When making meatballs or meatloaf, choose no-salt-added seasonings and unsalted homemade bread crumbs or panko. For stocks and broths, follow Foung's example and save leftover poultry and meat bones to make homemade versions that are even lower in sodium than the prepackaged low-sodium versions. When it comes to snacks and treats, making your own gives you complete control over the ingredients, which means you can make favorites like Hot Soft Pretzels and Carrot Cake with Cream Cheese Frosting. These versions are not only lower in sodium but they're also healthier overall, thanks to ingredients such as whole-wheat flour and olive oil in the pretzels, and applesauce and fat-free milk, which replace fattier, more sugary ingredients in the cake. According to Foung, the key to cooking with less salt is to take advantage of the sweet, sour, bitter, umami, and salty flavors that are already in the foods you eat. "All five tastes can be found in foods naturally," she says, noting that when people complain about low-sodium food being bland, it's often because the salt was taken out of a dish but nothing was added to maximize the flavor. Foung, who leads low-sodium grocery tours to help cooks shop for the best ingredients for low-salt recipes, says the first section she heads to is the produce aisle, where the mushrooms are: "Anytime I need something to taste meatier, mushrooms are my go-to," says Foung. The fungi replicate the umami taste and mouthfeel that cured meats, soy sauce, Parmesan cheese, fish sauce, and miso all provide—sans salt. Foung livens up meals with pickled grapes, beets, and other vegetables, prepared with spices but no salt, and suggests that the fruit aisle is a great place to pick up ingredients to surprise your palate in savory preparations—think oranges for couscous, blueberries for steak sauce—as well as all-important lemons and limes, which add tartness without sodium. Foung also keeps an arsenal of herbs and spices—rosemary, thyme, parsley, cumin, and paprika, just to name a few—often adding dried herbs during cooking and fresh herbs at the end for zing and eye appeal. "When something is beautiful, you enjoy it more." She advocates getting creative and being adventurous, too. "Pick one herb and use it as many ways as possible during the week. Or pick a spice you have never heard of or never used and try it." Other ingredients such as garlic, fresh chiles, citrus juice and zest, vinegar, honey, and molasses can all help compensate for the reduction of salt. Put these principles into practice with recipes like Hake with Wild Mushrooms, Indian Spiced Carrot Soup with Ginger, Orzo, Green Bean, and Fennel Salad with Dill Pesto, Summer Vegetable Stir-Fry, and Chicken and Parsnip "Fries" with Spicy Vinegar. Some of your go-to recipes may be full of high-sodium ingredients, but before you despair of ever making your favorite stir-fry again, think about what really makes something delicious. When considering substitutions for high-sodium recipe ingredients, Foung suggests asking yourself, What does it look like? What does it taste like? What does it feel like? Aim to replicate at least one of those qualities—appearance, taste, or texture. When making Tamarind "Teriyaki" Chicken Skewers, let go of the idea of replicating the exact flavor of teriyaki sauce, traditionally laden with soy sauce, and instead focus on creating a similar color and viscosity, which Foung achieved with tamarind paste, brown sugar, molasses, and rice vinegar. Remember, too, that flavor isn't derived from ingredients only, but also from your cooking method: "Your oven, slow cooker, and grill also bring a lot of flavor to food," Foung points out. Slow-roasting or grilling allows flavors to develop and deepen—without the added sprinkle of salt—in these recipes: Slow-Roasted Tomatoes, Halibut with Roasted Vegetables and Spicy Cilantro Sauce, Roasted Broccoli with Raisin Vinaigrette, Grilled Pork Loin with Fire-Roasted Pineapple Salsa, Flank Steak Salad with Frisée and Charred Pepper Salsa, and Grilled Chicken and Ratatouille. When modifying recipes to reduce sodium, Foung takes inspiration from both vegan and gluten-free diets (among others)—which has led to some inspired and delicious substitutions, like crispy oven-baked garbanzos instead of bacon bits in a salad. Instead of using Canadian bacon for her eggs Benedict, she uses thin slices of sweet potato rubbed with smoked paprika, cumin, turmeric, ground white pepper, and olive oil. In recipes that call for bread crumbs, such as meatballs, mac and cheese, and even crab cakes, she subs in quinoa, which is naturally low-sodium. And in her recipe for Zucchini-Wrapped Halibut "Scallops," halibut replaces the saltier scallops, and bacon (which Foung says is one of the few foods she has not been able to reproduce without salt) is swapped out for zucchini. Don't toss the salt shaker entirely: There are lots of ways to be smarter about salt when you do use it. "When cooking, add salt sparingly at the end for the most intense flavor," says Renza. Just remember that salt is salt: kosher, sea salt, or regular table salt—they're all the same. "One teaspoon of table salt contains about 2,300 mg of sodium, and all salts contain roughly the same amount regardless of where they come from," says Renza. Foung advises "start[ing]: as close to zero as possible" with salt and adding just a little at a time, whether it's a sprinkle of salt, cheese, capers, or salty condiments like Sriracha. Sometimes it's better to think about what you can have rather than what you can't, so take heart in that increasing your consumption of other nutrients—notably potassium, calcium, magnesium, and fiber—can also help maintain healthy blood pressure and can blunt sodium's effects. According to Renza, good sources of potassium include potatoes, sweet potatoes, cantaloupe, apricots, raisins, halibut, and tuna; for calcium, greens (such as collards) and soybeans; spinach, seeds (such as pumpkin), and whole grains for magnesium; and beans, lentils, and pears for fiber. Although some vegetables, including chard, carrots, spinach, beets, and celery, are naturally higher in sodium, unless you have a serious health condition that requires extremely low sodium levels, the nutritional benefits of eating them generally outweigh the downsides. Or take advantage of their natural saltiness, like Foung does in her Greek Salad with Pickled "Beet" Olives. While certain veggies can add a "luscious saltiness" to many dishes, they're neither likely to break the bank on your daily sodium budget nor muddle your food's flavors. A few more recipes that incorporate naturally salty-tasting ingredients but are still low in sodium include Blood Orange, Beet, and Fennel Salad, Sautéed Greens with Cannellini Beans and Garlic, and Red Lentil and Carrot Soup. As Foung puts it, once you get over your "oversalted expectations," you're likely to discover a whole new world of flavor in your food. That you'll become a better cook in the process, too? Not bad at all! © Life is Fukuzatsu/All Rights Reserved.